The market for girl’s princess beds is a pretty crowded one. Just one look online and you’ll see that there’s a number of different products available, all offering generally the same functionality. So how do you choose the perfect bed? We’ve taken a look at the Step2 Princess Palace Twin Bed and given it the full lowdown in our review. Is this the perfect bed for little girls? Read on to find out more. The name of this product pretty much sums up exactly what it is. This is a twin bed designed with a princess palace theme. That doesn’t mean the bed is designed to look like it belongs in a princess castle, but is actually designed to look like a princess castle. This means that the design of the bed is a little less subtle than some other products on the market, but most little girls are still going to fall in love with it. Something particularly worth pointing out is the fact that the bed is built with plastic materials. The majority of beds we’ve reviewed use a wooden exterior and build quality, but Step2’s product is actually plastic. How you feel about this largely depends on your preferences, but we’ve definitely found that the bed is more durable because of this material choice. It’s quite easy to wipe the bed clean and remove any staining. To make your child’s sleeping experience all the more exciting, it’s pretty nice to see that Step2 have included a built-in light with this bed. It requires three AAA batteries to operate, but gives off a pretty decent shine. It looks great but is also perfect to allow kids to read, do their homework or just relax in bed. 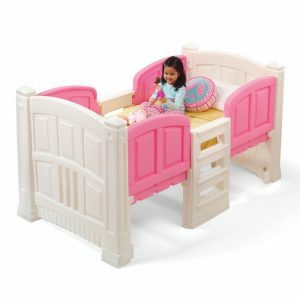 The Step2 princess palace twin bed fits a twin bed mattress, which isn’t included with the bed. This does mean that you won’t have to buy a specialist mattress for use with the bed and you can bring over the mattress from your child’s current bed. A: No.But it fits a twin bed mattress. A: It’s 52.2 x 89 x 49.2 inches.It’s 124 pounds. A: 36 months – 7 years. Step2 have a whole range of different products, all targeted at young girls. We’ve taken a look at an alternative product from brand for comparison’s sake. In terms of design, the Step2 Girl’s Lot and Storage Twin Bed is pretty similar in nature to the aforementioned product. 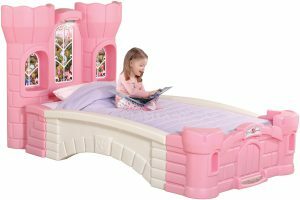 It’s designed to look and feel like a princess castle, however, we do feel that the design of this product is a little more basic in comparison to its sister product. One big notable difference is the fact that this is a loft bed. It’s designed to be raised off the ground, offering plenty of storage space underneath. There isn’t enough space here for another bed, but you could easily store some toys beneath the bed. It’s a nice little addition and one that we don’t see many kid’s beds offering. Which one of these two products you choose largely depends on whether or not you need that extra storage space and how much you care about the design of the bed? They may look pretty similar, but these are actually two very different products. In conclusion, Step2’s products without a doubt prove that they’re one of the leaders in producing the perfect beds for little girls. There’s a lot to love about this Princess Palace Twin Bed, but that doesn’t mean the product is without its pitfalls. Consider carefully what you need from your kid’s bed before jumping in and buying this product.